(2012.201.B0418B.0359, Oklahoma Publishing Company Photography Collection, OHS). 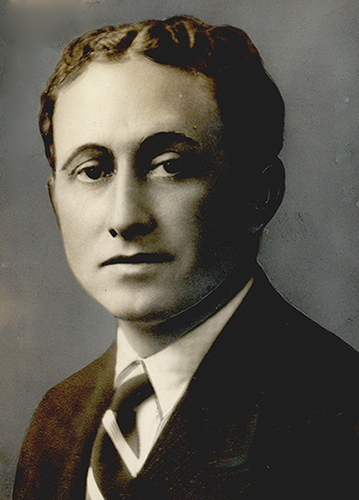 Historian and novelist and the only son in a family of five children born to William Shirley and Eugenia Mathews in Pawhuska, Oklahoma, John Joseph Mathews was one-eighth Osage. He was the grandson of Bill Williams, the legendary mountain man who lived and worked among the tribe. Young Mathews attended public schools in Pawhuska. As a young boy he rode his horse through the Osage Hills, developing an appreciation and love for his native culture and terrain. During World War I he enlisted in the U.S. Army and served in the cavalry, but he later became a pilot in the Twenty-fifth Squadron, flying the Jenny, Curtis H, and DeHavilland airplanes. His experiences gave him a lifelong interest in aviation. After military service he returned to the University of Oklahoma and in 1920 graduated with a degree in geology. He attended Oxford University at his own expense, not as a Rhodes scholar, and finished in 1923 as one of that school's first graduates of American Indian descent. He then studied international relations at the University of Geneva while the League of Nations was in session. During a hunting trip in North Africa in the late 1920s, after observing a native tribe's rituals, he decided that his own people had a culture that should be preserved. Mathews returned to his country and started "talking to the old men." He became devoted to collecting, restoring, and preserving Osage culture. He began writing and publishing. In 1932 the University of Oklahoma Press released his novel Wah'Kon-tah: The Osage and the White Man's Road, which became a Book-of-the-Month Club selection, reportedly the first university press book to be so honored. His second Osage novel was Sundown in 1934. His third book, Talking to the Moon (1945), written after living alone in the Osage Hills for ten years, is a classic nature study. In 1951 the University of Oklahoma Press published Life and Death of an Oilman: The Career of E. W. Marland, his only attempt at writing biography saturated with Oklahoma history, and in 1961 published his thirty-year-long oral history project The Osages: Children of the Middle Waters. Mathews's two children from a brief marriage, son John and daughter Virginia, acquired the same intellectual inquisitiveness that motivated him, and they became members of the academic, publishing, and library communities. John Hunt, whom Mathews considered to be a stepson, wrote about the Osage murders in The Grey Horse Legacy (1968). Mathews served on the Osage Tribal Council from 1934 through 1942 and was a major figure in the development of the tribal museum in Pawhuska. He was a Democrat, but not politically active. He was working on his autobiography at the time of his death in June 1979. In 1996 the Oklahoma Historical Society posthumously inducted John Joseph Mathews into the Oklahoma Historians Hall of Fame. Bob L. Blackburn, "Oklahoma Historians Hall of Fame—John Joseph Mathews," The Chronicles of Oklahoma 74 (Fall 1996). Bob Foreman, "Mathews' New Book Will Be Whopper," Tulsa (Oklahoma) Tribune, 3 November 1958. Guy Logsdon, "John Joseph Mathews—A Conversation," Nimrod 16 (Spring/Summer 1972). Guy Logsdon, "Mathews, John Joseph," The Encyclopedia of Oklahoma History and Culture, https://www.okhistory.org/publications/enc/entry.php?entry=MA037.